Fluffy Waffle & Fried Chicken (RM22++) for brunch? If the thought of hunky crispy fried chook paired with waffles leave you crowing with delight, then make haste to The Daily Grind for your share of this delectable dish every weekend from 9am to 2pm. 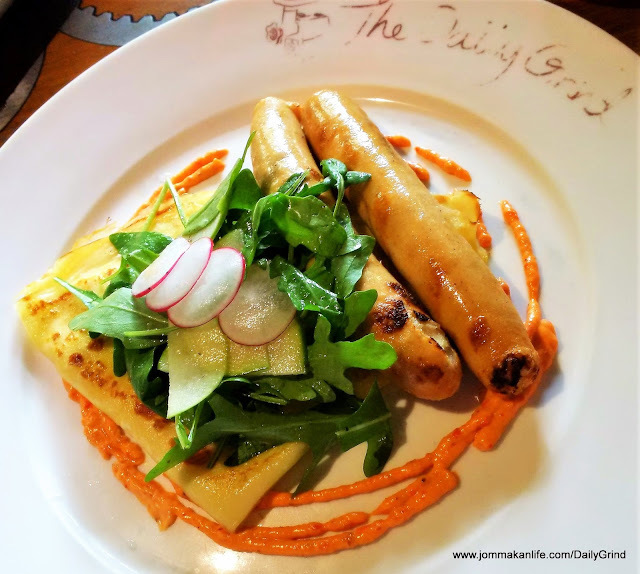 This long-standing casual eatery has a cheerful and laidback vibe about it so feel free to saunter in with your brood or besties in tow for a good chow-down. Served with spicy tomato chutney and maple syrup, the boneless chicken fillet was flavoursome; the outer layer of skin coated with crumbly, crunchy batter. Several slices of briny beefy 'ham' drizzled with maple syrup complete the delish platter. 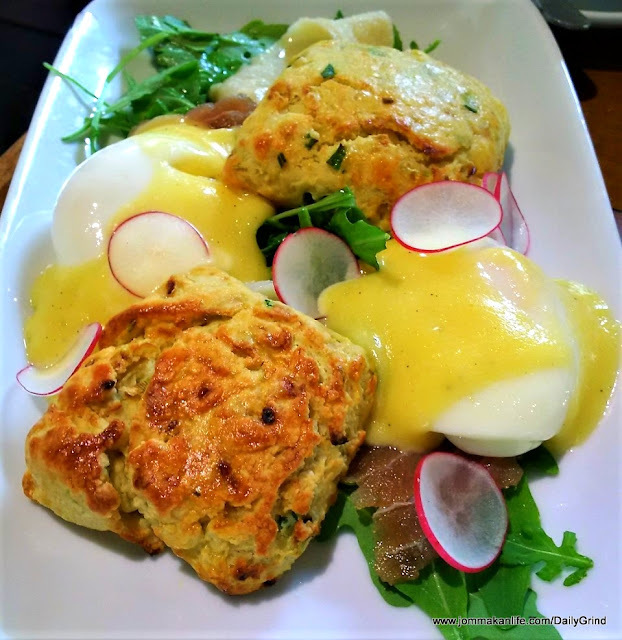 Top placing went to crumbly Smokin' Seaside Scones (RM28++) - a creative, savoury permutation of classic English scones which formed a solid flavoursome basis for a pair of poached eggs with hollandaise sauce alongside smoked tuna and swordfish, and fresh peppery rocket. My personal fave of Goddess Bowl (RM22++) edged in at third place...it could have easily trumped the rest just on looks alone especially the generous pool of smooth house-made Vietnamese yoghurt in plain and blueberry flavours. A milieu of colourful edible flowers, fresh berries, mango dices, macadamia nuts, pumpkin seeds, goji berries, oats, coconut flakes and berries coulis surrounded the lush, tangy yoghurt. Neck to neck in terms of subtly sweet appeal would be Pancake Soufflé (RM23++). The stack of pillow-soft pancakes resembling soufflé drenched in lemon cream was feather-light, with textural interest lent by scatterings of wild berries and assorted nuts, and shards of honeycomb. Ideal for the sweet-toothed without loading up on too much guilt. Named after two historical heavyweights, the Napoleon & Churchill (RM25++) was anything but. 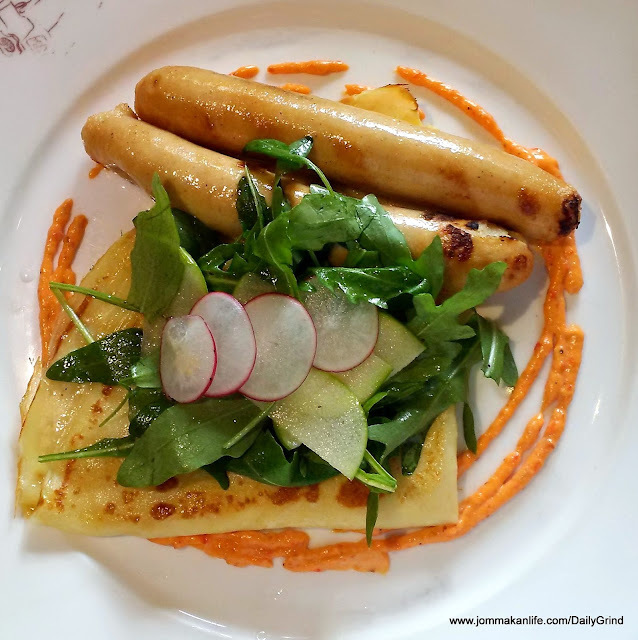 A fallback for those who prefer their brunch along the perennial pairing of sausage and eggs, this plate of savoury cheddar cheese-filled crepes drew us in with seared chicken sausages and a salad of fresh rocket and green apple slices with romesco aioli. The savoury crepes made a nice change from the usual bread or potato hash found in most brunch platters. A shoo-in for less adventurous eaters who like the tried-and-tested with just that slight twist. Tickle the funny bone of prankster friends or family members with a sense of fun and humour with The Mockery (RM18++). It looks like a classic English breakfast but doesn't taste anything like it at all! Suffice to say we had a good laugh digging into the inventive, mind-bending creations. Since The Daily Grind's reputation is built on burgers, it's inconceivable something like Burger Me Breakfast (RM27) would appear in the brunch array. Burger fans can rejoice for this delectable dish comprises brioche bun bearing a juicy beef patty and crisp slices of beef bacon, livened up with tomato jam and hollandaise sauce. Satisfying fare to start lazy Sundays with. Salty and sweet accents reigned in the Herb Brioche Pudding (RM29++). Laden with salted caramel, walnuts, sultanas, air-dried beef and rum, we were nonplussed by this unconventional speciality. Frankly, I wasn't gaga over the busy mixture of flavours but go ahead, give it a go and decide for yourself. Rum & raisin ice cream is so hard to come by these days that I'd steer towards Captain Morgan's French Toast (RM23++) in all likelihood. Studded with plump rum-soaked raisins, the heady, faintly spicy sweetness was splendid once it started to melt onto the thick slices of French toast. Crushed pistachios and maple syrup provided the finishing touches. For brunch reservations at The Daily Grind, please call: 03-2287 6708. Address: LG8, Lower Ground Floor, Bangsar Village 1, Jalan Telawi, KL.